The amount of overall refraction caused by the passage of a light ray through a prism is often expressed in terms of the angle of deviation ( ). The angle of deviation is the angle made between the incident ray of light entering the first face of the prism and the refracted ray that emerges from the second face of the prism. Because of the different indices of refraction for the different wavelengths of visible light, the angle of deviation varies with wavelength. 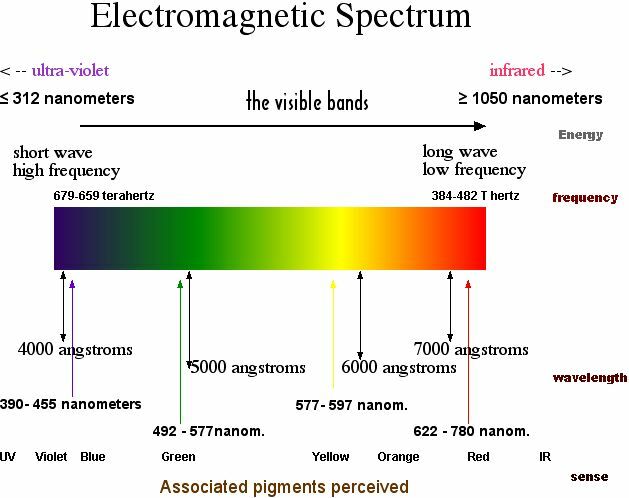 Colors of the visible light spectrum that have shorter wavelengths (BIV) will deviate more from their original path than the colors with longer wavelengths (ROY). 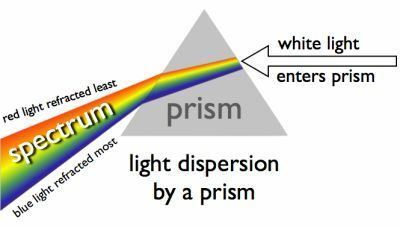 The emergence of different colors of light from a triangular prism at different angles leads an observer to see the component colors of visible light separated from each other. 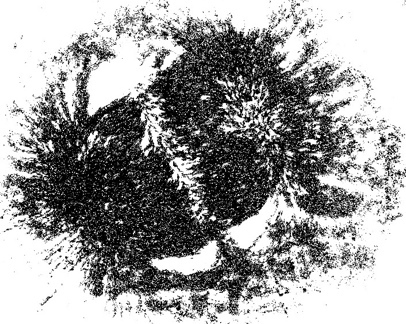 To get a sense for a magnetic field move your cursor over the above photograph of iron filings. We all live in a world of magnetic attraction and electrical flow. When moved in an electrical field a magnet induces a flow of electrons, or electricity. People sense that flow as color, heat and pressure but the energy contained in the world can be thought of as disturbing an inherent state of rest. The cartoon depiction of a hydrogen atom here shows that atoms are never at rest and as the electron (blue) speeds about the atomic nucleus (red = one proton) there is an exchange of electromagnetic radiation. That radiation has a specific wavelength, and frequency. H or hydrogen is the most abundant atomic element in the universe and the least massive because it contains --most often-- only one positively charged entity called a proton. The disturbance can be measured by the wavelength of the disturbance, the frequency of the disturbance, and the impact of that disturbance on solutions of elements, compounds or atoms. Traditionally atoms were conceived of as little solar systems with electrons (shown here in red and "-") as small planets orbiting the dense nucleus or mass of protons (shown here in blue and "+") or neutrons (small and grey-white) that do not have an electrical charge but are slightly more massive than the proton. This planetary model however is less accurate than what quantum mechanics and nuclear research has discovered experimentally. That is because the atom does not behave like a start system and electrons are not solid or gaseous planets. Instead the neutron is drawn to display how it decays into a proton and an electron with an enormous release of radiation or high frequency energy. In addition there is evidence for the behavior of electrons that are not similar at all to the way planets orbit a star in a solar system. The figure below suggests that as they move at the speed of light over a distance of one angstrom unit that the electrons are quite bizarre in their motion. A compound is common in nature and describes the arrangement of atoms in certain molecules. Water, once considered a primary element, is now recognized as a compound of atomic elements. 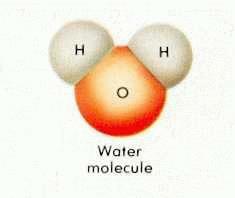 Whether as ice, vapor gas, or liquid, water is always composed of two hydrogen atoms and one oxygen atom. 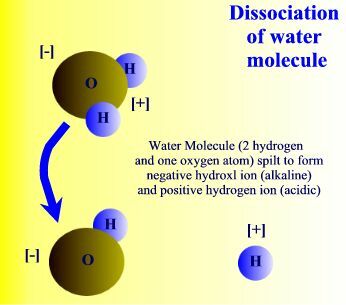 When exposed to solar radiation the water compound can split into an OH "radical," and a H+, hydrogen ion. 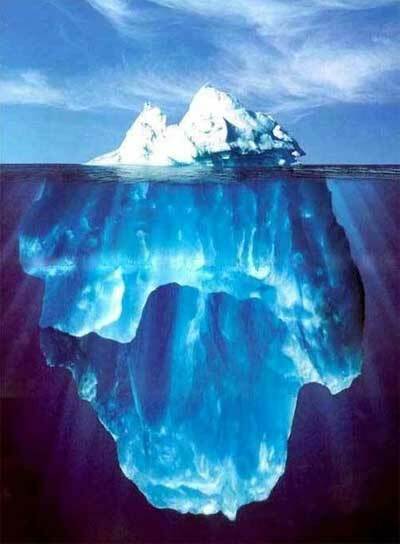 These are charged particles and their frequency in the water solution is revealed by its alkaline or acidic qualities. Electrical charges are accompanied by magnetic fields. 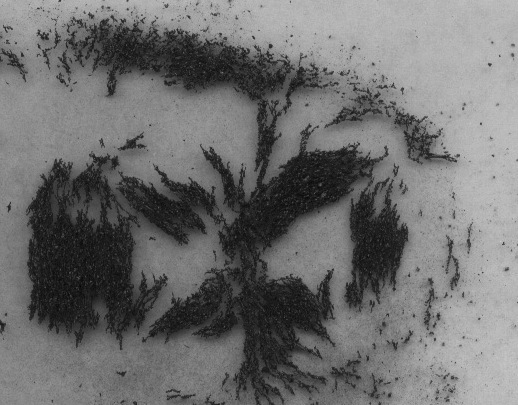 Electrical charges and the associated magnetic fields that were originally diagrammed by Michael Faraday. Frequency refers to how often a crest passes through a trough and to crest again.